Known as the ‘queen of gems’, pearls have been coveted for centuries, were presented to Chinese royalty as early as 2300BC and reserve their own exclusive place in history as the world’s oldest gemstone. The ancient Roman’s considered pearls to be the ultimate symbol of status, so much so that Julius Caesar passed a law limiting the wearing of pearls only to the ruling classes. Unlike gemstones that are derived and mined purely from the earth, a living organism produces a pearl which only adds to their allure and rarity. Symbolic of purity and feminine beauty, the glistening and lustrous pearl possess a stunning radiance that is only amplified when combined with other dazzling gemstones. We use Autore South Sea Pearls, which are mainly cultured in Australia, due to their exceptional quality, lustre, colour and size. South Sea pearls are known for their large size and crisp lustre in comparison to Akoya and Freshwater pearls. This is attributed to it being produced by a larger sized variety of saltwater oyster, and to the clean unsullied waters north of Broome, in which they are grown. The rarest forms of these pearls are golden in colour, almost emulating a burnished gold bead, with the depth of colour being an indication of rarity and substantial value. Although 90% of South sea pearls are a variation of white, cream or silver, these variations differ in overtones of rose, blue and green, making them the perfect match to multi coloured gemstones. We have seen this unique trend gain momentum across the industry, with pearls having a rebirth within the modern era alongside exquisite gemstones, reinventing the once traditional gem. 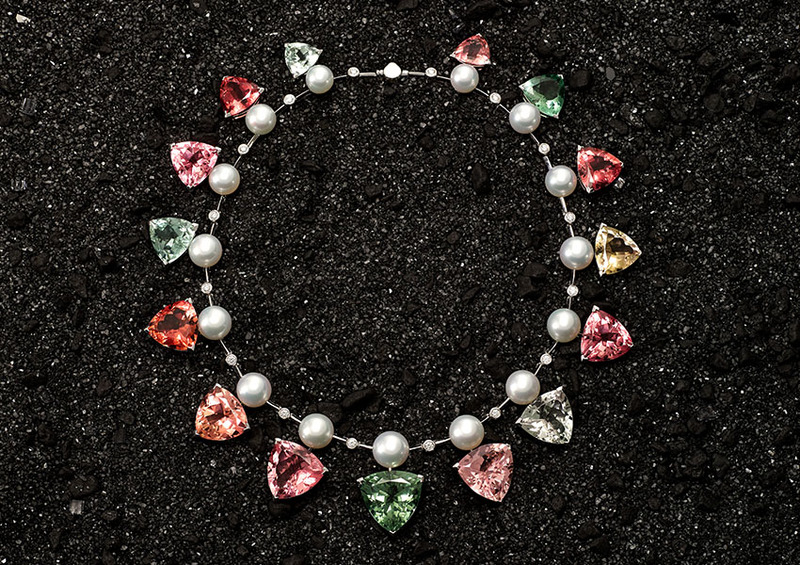 We are seeing the pearl juxtaposed against coloured stones to create unusual and creatively modern pieces of jewellery. Uniting the exquisite beauty of two 11mm Silver South Sea Pearls with magnificent Green and Pink Tourmalines totalling 31.96 carats, our Diamond and Tourmaline Drop Earrings and matching wreath necklace are an outstanding showcase of the modern vivacity of pearl and gemstone fusion. Celebrated for their depth and range of extraordinary colour, Tourmaline is one of the world’s most outstanding yet unusual gemstones. Ranging naturally in colours from intense reds, and pinks, to greens, blues and even black shades, Tourmaline has gained popularity in modern jewellery design due to its versatility. When accentuated with pearls, it offsets a playfully vivid contrast of colour and texture. To learn more about our Diamond and Tourmaline Drop Earrings and necklace pieces, contact the boutique to arrange a complimentary consultation.